The Hanging Gardens of Babylon was located in the east bank of Euphrates, South of Baghdad in Iraq. King Hammurabi was the most famous king of the Babylonian kingdom. Under his rule, the entire kingdom flourished. 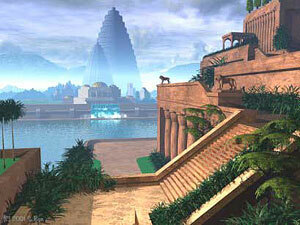 His son Nebuchadnezzar was the one who built the Hanging gardens of Babylon, one of the Seven marvels of world. Some stories have it that the Hanging Gardens went hundreds of feet into the air, but archaeological explorations have proved it wrong. The gardens did not really hang on the roof using cables or ropes. But derives this name from the fact that it was built on the roof top. According to the popular notion, Nebuchadnezzar built it to alleviate his wife's homesickness. He was married to Amyitis, daughter of the king Medes who seems to have had a passion for mountainous surroundings. Babylon's flat desert-like landscape made her pine for the mountains of Media where she was brought up. So the king decided to build an artificial, terraced hill lushly cultivated with trees and flowering plants. However some attribute this wonder to the Assyrian Queen Semiramis. According to Herodotus, the outer walls of the garden were 80 feet thick, 320 feet high, and 56 miles in length. He said that it was wide enough for a four-horse chariot to turn. Inside the inner walls there were fortresses and temples containing immense statues of solid gold. The Greek geographer Strabo, describes it as , "the garden consists of vaulted terraces raised one above another, and resting upon cube-shaped pillars. These are hollow and filled with earth to allow trees of the largest size to be planted. The pillars, the vaults, and terraces are constructed of baked brick and asphalt." However getting the water to the top and also avoiding the wreckage of the foundation once the water was released, posed a serious problem. Devising a workable watering system was more of a challenge than erecting the gardens. Babylon was an arid country and water from the Euphrates River had to be used to irrigate it. A chain pump was used to lift water to each level. A chain pump is two large wheels on top of each other. Buckets are hung on a chain that connects the wheels. The bucket goes into the water then comes up and goes into a new pool. The empty buckets go back into the water to be refilled. The water at the top is then emptied through into a channel gate that is like a artificial stream to water the gardens. Special care had to be taken while watering the garden because the garden ran the risk of collapsing if water were absorbed by the brick columns and foundation supporting the gardens. 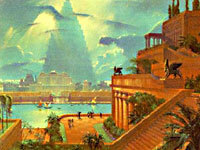 The ancient accounts on the Hanging Gardens of Babylon are scarce. Although several ancient Greek writers describe them, none ever saw them. And, "hanging gardens" was never mentioned on any of the numerous clay-tablet records that archeologists excavated from Babylon. What remains of the famed marvel is red brick rubble. Its estimated lifespan was only a century or so. The chief cause of its destruction was the lack of maintenance.